How To Build A Christmas Tree Photos by Samuel E. Warren Jr.
Rayniel Saldana cuts strips into aluminum foil to create the branches for a Christmas Tree. Photo by Samuel E. Warren Jr.
Ranilo asks his Aunt Christy if the scrawny bamboo tree would make a good Christmas Tree. Christy shook her head No. “We can build a Christmas Tree,” she smiled. Only God can make a tree, but, the Warren nieces and nephews should realize by now, “Aunt Christy” will come up with a way to build a Christmas Tree. Ranilo helped Christy saw off a mop handle-sized branch from the bamboo tree. 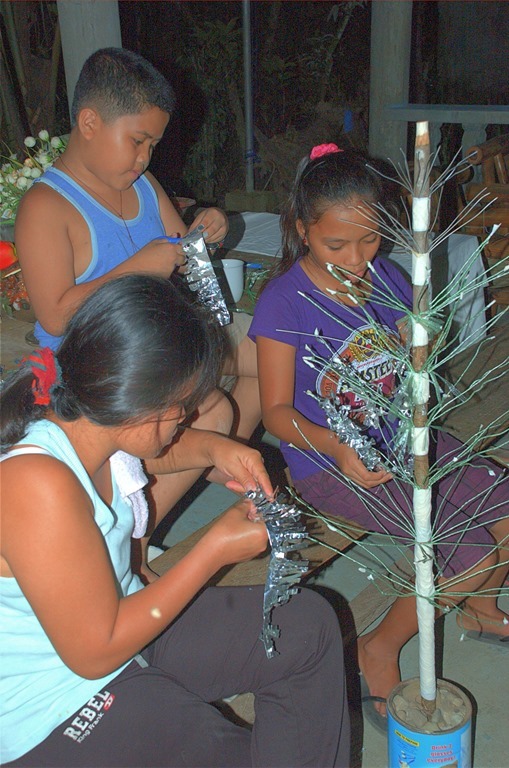 Leneil and Rayniel Saldana wrap aluminum foil around pieces of electrical wire strands, which serve as branches for this Christmas Tree. Junea Tanahale straightens her tree branch. Photo by Samuel E. Warren Jr. Instead of, the 3-pound Folger’s coffee can, she choose a Bear Brand can about the same sie to fill with rocks to serve as a tree stand. The pole-sized branch went into the center of the can and remained upright due to the rocks packed tightly around the artificial trunk. Christy then sent Junea, Ranyiel and Vanissa to a Sari Sari Store for aluminum foil. Christy got some discarded electrical wire and stripped off some of the insulation to create the rods for the branches. Ranilo got green Japanese rice paper to wrap the artificial trunk. In the United States, Christy would of used Reynold’s Wrap Heavy Duty Aluminum Foil, which she always wrapped the Thanksgiving and Christmas dinner turkeys in to cook. 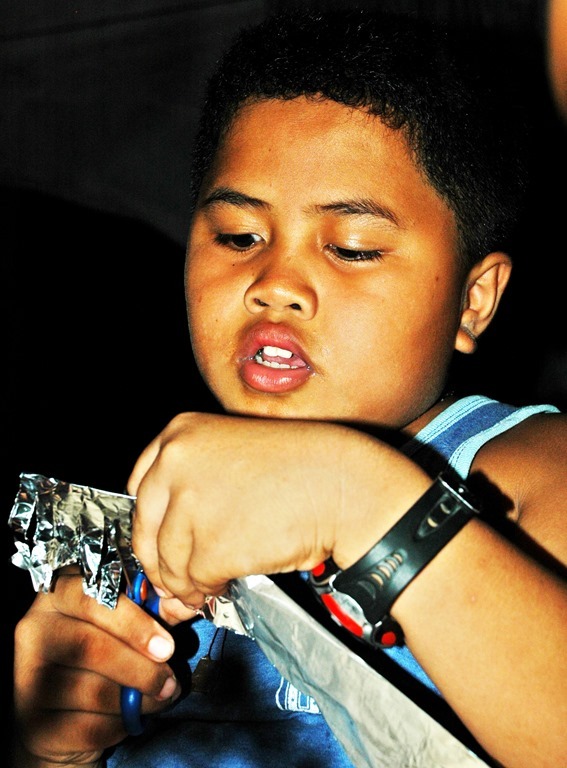 In Barangay Baras, the aluminum foil has a thinner quality. Christy cut strips and showed the kids how to fold the sheets in half. Once folded, they would cut incisions three-quarters of the way down to create the needles of the tree. 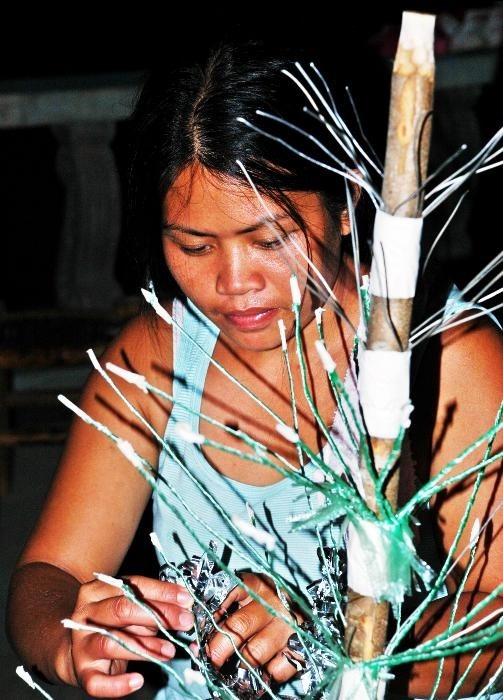 Leneil Saldana wraps aluminum foil around wire to create a tree branch. Photo by Samuel E. Warren Jr. Nonetheless, the twinkling tinsel look of the silver artificial tree reminded me of Aunt Bill and Uncle Audrey Irwin in Houston, Texas, who lived a few blocks from a “Maxwell House” coffee plant. On a spring evening, “The Good Till The Last Drop” aroma would reach you. The aroma of a cup of Maxwell House coffee always reminds me of Georgia Mavon Warren, my “Aunt Bill”, who loved her ice tea. She and Uncle Audrey always used a four foot silver artificial Christmas Tree. In 1959, a fat five pound black electric motor would be placed near the tree to hum and spin the spindle that would rotate the pie shaped disk in front of a light mounted on the motor. The light passing through the colored wedges of “The Color Wheel” would bathe the tree in changing shades of rainbow hues. The finished Christmas Tree stands ready for decorations. Photo by Samuel E. Warren Jr.
A 5-year-old boy, named, Sam, could sit for several minutes and stare up at the changing colors washing over the sparkling tree. A 57-year-old man, named, Sam, could stand and admire the work that “Aunt Christy” Warren and her volunteers had accomplished in a day’s time. The kids called it a night to get ready for school the next day. Christy and Leneil kept wrapping the foil around the branches until they ran out of foil. When the kids came home from school, Leneil and Christy were still wrapping the artificial branches in foil. Aluminum foil was applied around the tree stem over the rice paper. Christy’s sister, Esmeralda, showed up and helped wrap branches. By Day Two, the artificial tree was starting to look like an artificial Christmas Tree. By Monday 11 p.m., the tree was finished. Tuesday, the tree was placed in a bamboo plant stand built by Edwin Mora. Green material draped over the can and around the tree trunk serves as the tree skirt. Packages of strings of crafts beads become the garlands for the tree. Christy decides the weight of the strings could be too much for the branches, so, instead or circling the tree, the beaded garland is draped diagonally at an angle at different positions on the tree. A Christmas Angel tree top light packed in the shipped household goods assumed the command position a top the tree. Strings of craft beads serve as the garland for the built Christmas Tree. Photo by Samuel E. Warren Jr.